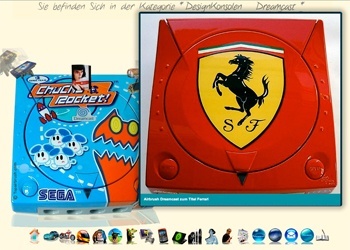 If you're a Dreamcast fan, then these custom-painted consoles are going to make you drool. It's hard to find a console more beloved than Sega's Dreamcast. Even though it was discontinued in 2001, games are still being developed for the system, and - speaking from personal experience - some of the original games have actually aged pretty well. Apparently developers aren't the only fans still creating content for the consoles, seeing as how an airbrush artist has started gaining a lot of attention for his custom paint jobs. German Artist Torsten Rachu actually airbrushes a just about anything you can imagine, including jackets, helmets, motorcycles, and game consoles. The latter includes current-gen systems, as well as a stunning collection of custom Dreamcast designs. You can see a wide variety of sample Dreamcasts on Rachu's website. I'm particularly enamored with the Jet Set Radio design, but the Resident Evil: Code Veronica one is pretty cool, too. Sadly, there doesn't appear to be a Sonic the Hedgehog Dreamcast on the site.